The South Russian Ovcharka is not for everyone. This very large breed can be dominant, wary of strangers, and is very lively making him difficult to care for. He is a great guardian breed however and would do well guarding cattle or flocks of sheep. The South Russian Ovcharka has the tendency to show dominant behavior, so he needs a more dominant owner to train him. This breed needs extensive socialization at an early stage to avoid any aggression problems due to his dominant nature. Protective, possessive, but obedient, this breed does not do well in the average household. He is good with other animals, however he should not be trusted around small and very passive pets. The South Russian Ovcharka requires acreage to thrive. If not given proper work and stimulation, this breed will become very bored making him a tyrant. The coat of this breed requires daily brushing down to the undercoat. 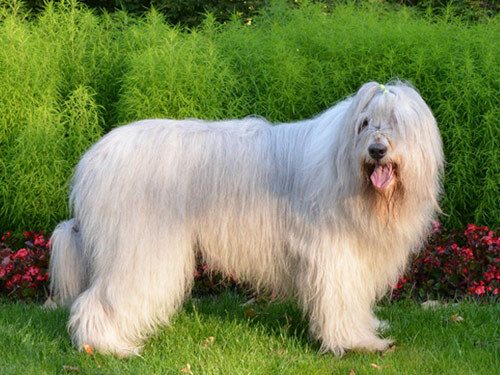 As this breed is very active, his coat has the tendency to become matted quickly. Around the mouth should be cleaned daily. The South Russian Ovcharka has a thick doublecoat. The coat should be long, thick, dense, and somewhat coarse. The undercoat should be soft, thick, and well developed. The South Russian Ovcharka requires firm and consistent training as he can be very independent and can have a short attention span. Given a dominant trainer/handler, this breed can do exceptionally well. The South Russian Ovcharka requires a large area, most likely acreage. He should be given a job, preferably guarding animals. This breed will not do well in an apartment or the average household.